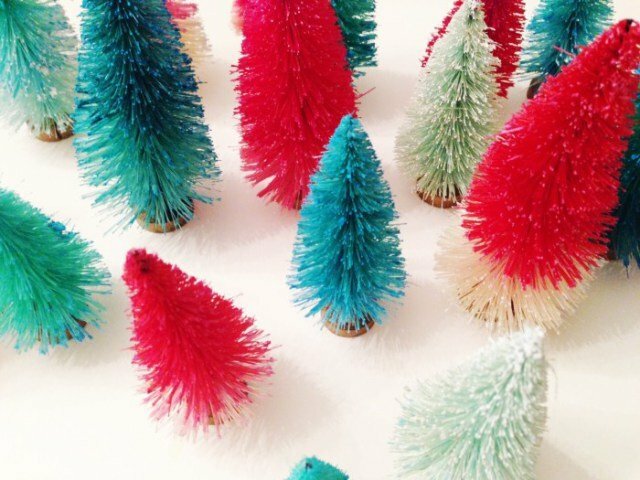 You see them everywhere these days — bottle brush trees in every color. You can buy them at lots of stores, but they can get pretty pricey. If you don’t want to spend the money on ones that are already made, you can DIY them yourself. 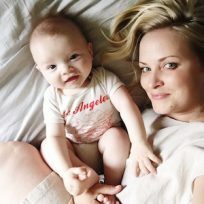 And they are easier than you think! I always feel much more satisfied with my holiday decorating when I have made the project myself. 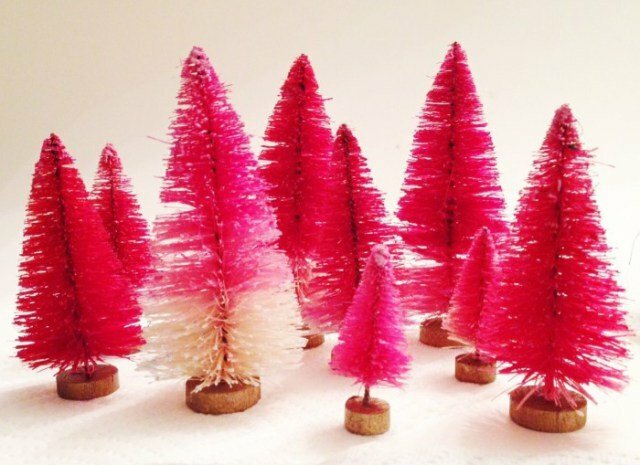 DIY bottle brush trees are the perfect holiday accent to dress up a seasonal mantle, holiday table or bookshelf! Warning: these are way addicting and if you are making them for gifts you are going to want to keep them for yourself. Remove all of your bottle brush trees from packaging. Mix about 1/2 bleach and 1/2 hot water in your tub. Immerse your trees (you can do one at a time, a few together, or all of them at once) into the bleach mixture. You’ll see some color come off immediately. Some of my trees turned white really quickly, and others took a few minutes. Once your tree is the shade of white you want (they are more of an antique, yellowed white than a bright white) remove them one at a time with your tongs and rinse under cold water. Stand them up on paper towels to dry (I lined a cookie sheet with paper towels and placed them on it so I could move it out of the way if necessary). 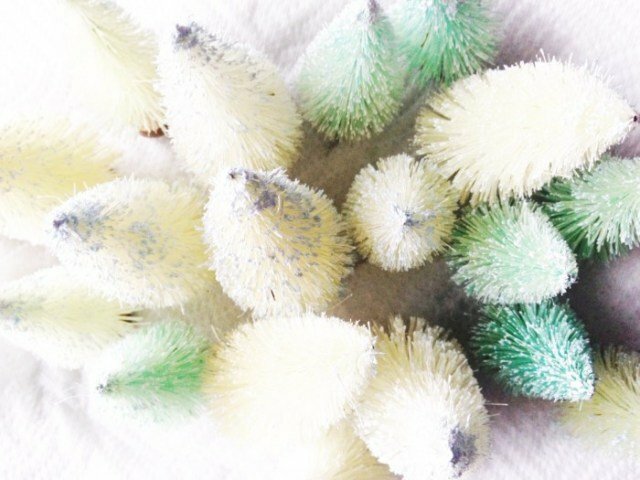 If you want a minty green color tree like some of the ones above, take them out of the bleach before they turn white. 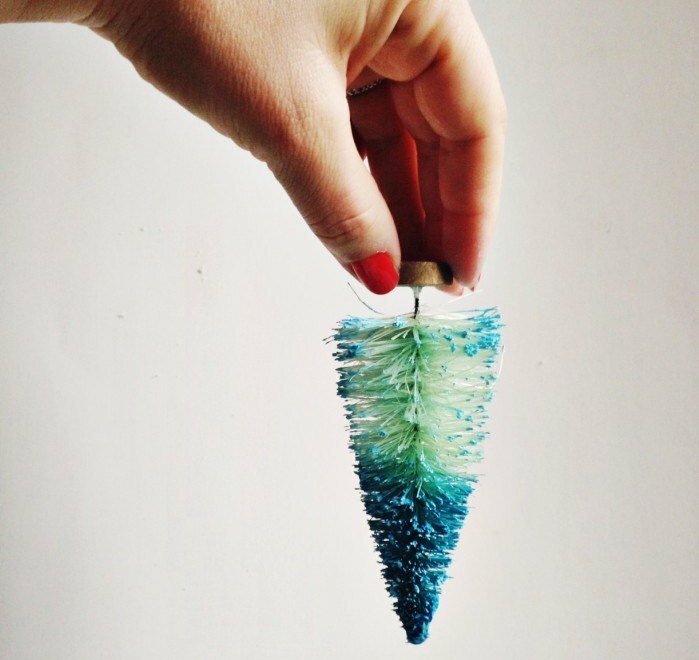 Once your trees dry, you can dye them the color you want! Rit dye (or pretty much any kind of dye you want to use) I used this one and this one. First, you need to make sure you have bleached your trees like I did above. Once your bleached trees are dry they are ready to dye. Mix your colors. I used half liquid Rit dye, 1/2 hot water in a plastic cup. Dip your tree. You can dip dye them half way for a color blocked effect or dye them all the way for a bit, then halfway for a bit longer for an ombré effect. After you’ve dyed it the way you like, rinse in cold water till water runs clear. Let dry for a few hours or overnight. 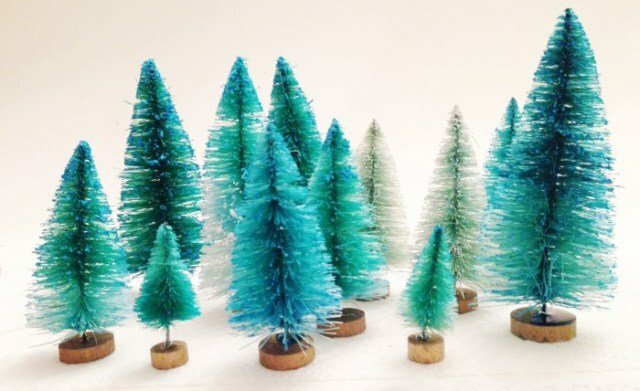 Aren’t these just the happiest little trees? 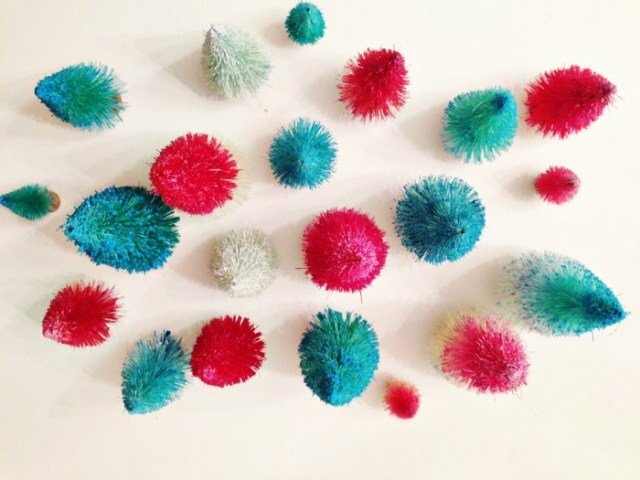 There are so many ways you can use them for holiday decor! You can line them up and display them on a shelf or mantle, tie them to Christmas gifts, or use them to do other holiday crafts. Happy holiday crafting!